"We want to make your house a great place to live." Tal's Handyman Service keeps homes and businesses running smoothly by doing repairs, maintenance and improvements. Established in 2001, Tal's Handyman Service began as a part-time business and has rapidly grown to become a team of skilled handymen servicing Brisbane. When you call us, you will be contacted by a friendly member of our team who will take the time to listen and discuss the project in detail. We'll match your project with the skills of a talented handyman. All of our handymen are carefully screened for their qualifications. 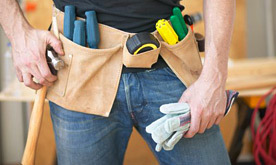 A Tal's Handyman is a skilled, service-oriented professional. We take pride in our work - and it shows. Click here to read testimonials by happy customers. Call 0421 239 364 for a free quote!